December 6, 2019, at 6:00 pm Florence Community Park. 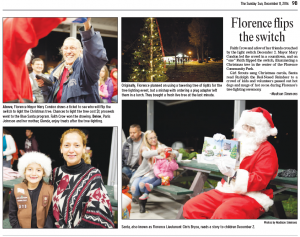 The City of Florence provides Hot Chocolate and Cookies free of charge. Come out and visit with Santa Claus. This event is held every year to light the tree and collect toys and monetary donations for the Florence Police Department Blue Santa Program.